← 6 reasons to go to #SUNY Alumni Night at Yankee Stadium on 9/27, one that includes FREE tickets to a game next year! 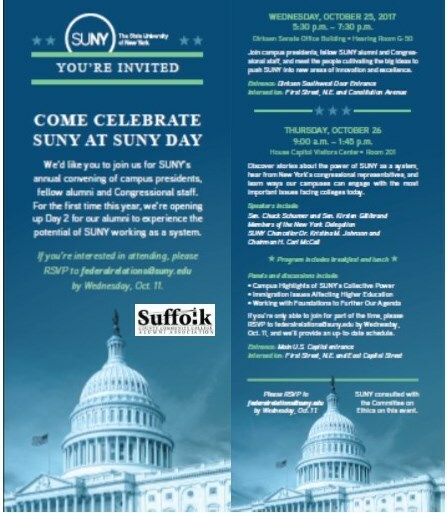 RSVP by 10/11/17 for SUNY DAY D.C.
We’d like you to join us for SUNY’s annual convening of campus presidents, fellow alumni and Congressional staff. For the first time this year, we’re opening up Day 2 for our alumni to experience the potential of SUNY working as a system. If you’re interested in attending, please RSVP to federalrelations@suny.edu by Wednesday, Oct. 11. Join campus presidents, fellow SUNY alumni and Congressional staff, and meet the people cultivating the big ideas to push SUNY into new areas of innovation and excellence. Discover stories about the power of SUNY as a system, hear from New York’s congressional representatives, and learn ways our campuses can engage with the most important issues facing colleges today. If you’re only able to join for part of the time, please RSVP to federalrelations@suny.edu by Wednesday, Oct. 11, and we’ll provide an up-to-date schedule. SUNY consulted with the Committee on Ethics on this event. Please RSVP to federalrelations@suny.edu by Wednesday, Oct. 11. Posted on September 26, 2017, in Events and tagged #SCCCAlumni, #SUNYSFLK, Congress, DC, Free, Panel Discussion, Reception, Senate, State University of New York, Suffolk County Community College, SUNY. Bookmark the permalink. Leave a comment.